Lots of people have questions about what to take on Space A flight, what you take depends on if your flying the Rotator or Cargo plane or something similar. Flying the Rotator is a commercial flight that has been contacted by the military. 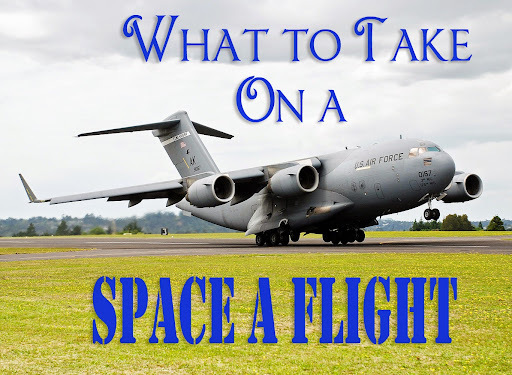 Other planes such as cargo planes C-17’s, C-5’s, etc will have interesting set ups but we loved our Cargo flight experience, you can read about it here I’ve complied a list of What You Need To Fly Space A. This is like flying on a normal commercial plane, so you’d take a normal carry on with typical items. Snacks are always a good idea for long flights, remember no liquids until purchased after security. You should be served a meal & a snack along with drinks. Neck pillows or blankets, although the airline should provide pillows & blankets as well. Any electronics or books to keep you entertained, make sure you remember to charge your devices. This flying situation can require some much more unusual items for a successful flight. Snacks are always a good idea for long flights, remember no liquids until purchased after security. Also know that if you want a meal on these flights you’ll have to purchase them for $4.50 each. Here is a photo of a meal we purchased. 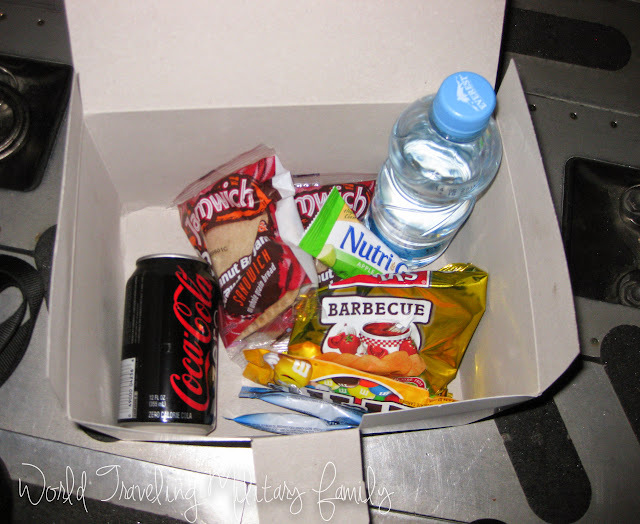 They also offer a free snack on some flights which could include water, candy, fruit, crackers, etc. These flights can get cold so it’s highly recommended that you dress in layers. Also make sure you take some blankets with you, I took a bag full with me that we carried on. They are much more lax with the carry ons for these flights but take into consideration how much you pack if you’ll be flying commercial when you land in the States, you may want an extra suitcase or duffle bag to check the blankets at that point. I even took several small travel pillows as well! I had all blankets & pillows in space bags so that I could fit more in the bag to carry on. I also highly recommend taking self inflating sleeping bags. The great thing about these flights is that your not confined to your seats, in fact your seats are often jump seats against the wall! Your able to spread out and lay on the floor after take off but the floor does get cold! We bought our self inflating mats at the BX in the States but you can also find them at Amazon, they look like these. These rolled up into individual carrying bags and are acceptable as carry ons for the Space A flights, again keep in mind if you’ll be using a commercial fight and what you’ll do with them. There were also several people who had hammocks that they hung and were laying in it! I also seen several sleeping bags in use as well. It’s all up to you and what you want to carry. There are bathrooms on the flight (yes, I’ve been asked this often) but they often don’t have running water to wash your hands so bringing a small thing of sanitizer or baby wipes could be handy for cleaning off your hands. There is often hand sanitizer in the bathroom. Any electronics or books to keep you entertained, make sure you remember to charge your devices, but also know that some of the flights have electrical (110V) outlets in the wall as well! We were able to charge our iPhones & iPads on the flights. Look for them along the wall as your choosing your seats. Seating is not assigned, it’s a first come first serve kinda thing, but there will be a seat for everyone and we’re all military so people will make sure families are together. If you get cold easily ask where the warm air is blown from, you could feel it towards the front of the flight on our ride to the States and in the back on the flight back. Make sure to wear closed toe shoes! I normally just wear my comfy ballet style flats. If your going somewhere warm just keep a pair of flip flops in the side pocket of your backpack and you and pop them on as soon as you get off the plane. I also often wear my flip flops until right before boarding then throw my flats on 😉 And I take some warm socks for when I am trying to sleep as well. Also these planes are loud, ear plugs will be handed out, but you and bring others if you prefer them. I like the ear planes (SP) for when I fly. Also noise reducing over the ear guards make work better for babies and little kids than the ear plugs. Carseats for your kids. 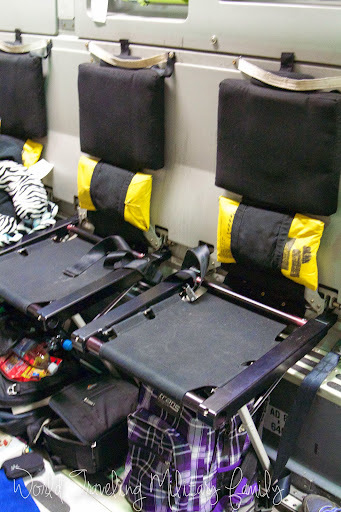 Yes, these will fit in the jump seats. We personally love the ability to walk around, spread out and lay on the floor, and such on the Cargo flights, you can read about our trip here. Any other items you would suggest for bringing on a Space A flight? You have it pretty well nailed down. I am a former loadmaster, (flight attendant to the uninitiated), and one who had to deal with airsickness quite a bit. If anyone in your family is prone to motion sickness, there are several ways to make life more pleasant in flight. I have had luck with non-drowsy Dramamine if I need to be up and about during a flight, like when I have my daughter with me. But if I don’t need to be, Benadryl is the way to go. Sleeping is the best way to get through an 10 hour flight. Benadryl has anti-emetic qualities that are on par with some very expensive options. Also, sitting in a cooler environment makes a big difference in airsickness. I have had ice form in the back of the plane in August, just to prevent nausea. Also, another way to make life more pleasant, bring little slice and bake cookies or small treats that smell great and can be warmed in an oven. All cargo aircraft have a small oven, and the smell of treats baking overpowers the smells of the plane, which isn’t very lovely in the first place. I normally don’t get motion sickness but on the flight back had a bit, Dramamine didn’t help so I’ll try the Benadryl next time! Plus hopefully it’ll help because I can’t normally sleep on the flights either. These are all fabulous tips!! We’re stationed in Belgium and will be taking a hop back to Texas out of Ramstein in September. It’ll be our first experience on a hop and we’ll have two dogs and a 6 month old with us. Have you taken pets with you? I’m always looking for experiences with dogs since we aren’t shipping them through a pet shipping company. Space A should not be confused with flying the Rotator for a PCS. Pets are not allowed to travel with you for Space A but can be booked on the Rotator on PCS orders. Yes, we flew here with our Westie. If you use the search bar on the right and search PCS pets you should find it. Hey Mrs B I just spoke with the military terminal in Charleston SC regarding some Space A flights to Ramstein. I told them we are PCSing and had 2 small dogs and we didn’t want to go the route of the rotator out of BWI because the dogs would be down in cargo. They said the only way pets could fly on the Space A was if we did have PCS orders. Did something change or am I getting wrong information from Charleston? Hi there! Sorry for the delay was in the States on Emergency Leave. Pets are never allowed to fly Space A (with only a few exceptions of service dogs but even then there are restrictions). Pets can fly on the Rotator (BWI, SETAC, etc) ON PCS orders only and if there is room on the plane. They only take 10 pets per flight so its best to book the Rotator early. I haven’t been on a space A flight in forever, but those are all seriously great tips! Space A flights are amazing! I hope you have a fantastic trip!